Thanos is a very experienced sailor, licensed to command Sailing Vessels of up to 200 tones. He is holding the Ocean Yachtmaster license issued by the UK Department of Transport and endorsed to be used on charter vessels on coastal or ocean passages. 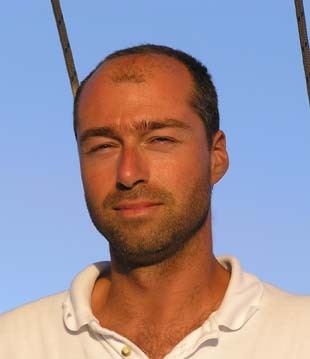 With 25 years sailing experience and thousands of sea miles covered, he has worked as a captain on charter and private yachts in England, Greece, France, Spain and the Caribbean. Additionally, he has done yacht deliveries across the Atlantic, the Caribbean, around Europe and through the Med. Having worked extensively on charter yachts, he knows very well the qualities of a good captain and host (and that is not just navigating and sailing the boat, as anyone with a bit of theoretical and practical knowledge can do that!). A very easy-going person, he will adapt the cruise to your own needs and make sure everybody is happy. His good knowledge of the area is very useful, as he will show you the best tavernas and bars as well as the sites of interest. In general, he is there to take care of everything and make sure you have a great time. Thanos was born in Greece in 1974, moved to England in 1993 where he lived until 2004 when he returned to Greece and started organizing these Greek Island cruises with his sailing yacht Alexandros. Although he studied Civil Engineering, he decided to follow the captain's career, as the sea has always been his great love. When in England, he was based in Plymouth but he spent a lot of time working around Europe on yachts, and having lived in various countries he speaks very fluent English, French, a bit of Spanish, Polish and his native language which is Greek. He is a commercial SCUBA diver HSE PART IV, as well as a PADI Rescue Diver, and if you are interested he can organize a bit of SCUBA diving for you. As safety is an important issue in this job, Thanos has been trained in First Aid and specialized in sailing and diving related accidents, as well as Fire Fighting & Sea Survival. Finally, as an RYA Sailing and Powerboating Instructor he can teach you the art of sailing during your holiday. Antonis has sailed extensively around the Greek Islands and he will take you to some of the prettiest villages and most secluded bays. He is licensed to command sailing vessels up to 24 meters in length and with his easy-going and friendly personality he will not only be the captain on your yacht, but your guide as well, making sure you have an unforgettable holiday. 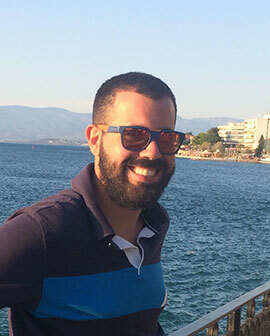 Antonis was born in Greece in 1993 and his great love for the sea and the easy-going way of life at the Greek Islands, led him to follow a career in yachting. However he is also a chef, so occasionally he sneaks into the galley to create one of his special dishes!! He is a sailing instructor so if you are interested, he can teach you the art of sailing during your cruise and he has also been trained in First Aid, Fire Fighting and Sea Survival, as safety is very important at sea. Antonis speaks English very fluently and of course Greek which is his mother language. In his spare time he enjoys cooking, photography and travel. 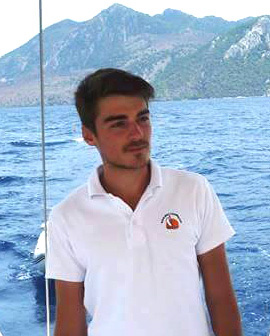 Fanis had a love for sailing and for the Greek Islands since an early age and after completing his studies as a naval architect and marine engineer he decided to follow a career in yachting. He was born in Greece in 1991 and when he’s not sailing he lives in Athens. Fanis is licensed to command vessels up to 24 meters in length and as safety onboard is very important he has been trained in First Aid, Fire Fighting and Sea Survival. He has a very nice personality, a good sense of humor and he enjoys taking his guests around his favorite islands. Fanis is very fluent in English, but also speaks German and of course Greek which is his native language. Just like the rest of us he likes to travel and in his free time he surfs, snow skis and cycles. As he has learnt the art of cocktail making from a friend of his, from time to time you will see him coming out of the galley with a few cocktails for his guests! Alicia has a great love for the sea and sailing, and having worked in the tourism industry for many years, she knows exactly what our guests need during their holiday. She is there to make you feel relaxed and comfortable and take care of all those little things that you want to forget about, during your vacation. She speaks very fluent English, French, Greek and of course Polish which is her native language. With her easy going and friendly personality she will make you feel at home straight away. What's more, she is an excellent cook who will prepare your breakfast and lunch every day, and for those who would like to have their dinner onboard as well, she will cook some delicious dishes! She is also a qualified captain (holding the RYA Dayskipper certificate), with many years of sailing experience and could take over the command of the yacht if she had to. Alicia was born in Poland in 1979 and as a licensed horse-riding instructor she has been taking people horse-trekking in the Polish mountains for many years. Although she graduated from university with a degree in French Literature, her love for traveling and the outdoors and her dream to work on sailing yachts has taken her to Greece, originally onboard sailing yacht Alexandros and currently onboard sailing yacht Velos. Before joining Thanos in 2005 organizing these Greek Island cruises on Alexandros, she spent a few years living and working both in France and the UK, spent a few summers grape picking at Beaujolais in France and 2 years working as an au-pair with a family in Scotland. She is great with kids, as she has been looking after three of them ranging from a baby to a 13 year old. With her gourmet dishes she has turned lunchtime into one of the best moments of the day, and with her skills, nice character and her great smile, Alicia will help make your holiday an unforgettable one. Just like the rest of us, Maria joined our world of sailing because she has a great love for the sea and the life on the Greek Islands. With her friendly personality she will make you feel at home the moment you step on the yacht and will make sure you have a great time during your cruise. Maria was born in Greece in 1995 spending all her winters in Athens and her summers on the beautiful island of Folegandros, where her parents run their business. 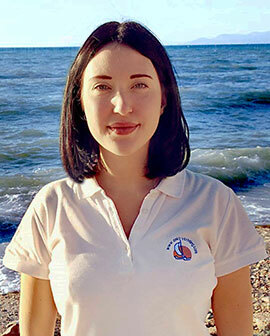 From an early age she developed a love for the sea and two of her favorite things are swimming and dinghy sailing. After spending a few years in Southampton (UK) studying International Tourism Management and at the same time working for a local ferry company, a hotel and a restaurant to gain experience in the hospitality sector, she returned to Greece and joined our beautiful world of sailing. Except for English which she speaks very fluently, she speaks Spanish and German but also Greek and Polish which are both her native languages as her father is Greek and her mother is Polish. She loves to travel and try the different countries’ cuisines and with her great cooking skills she will prepare Alicia’s delicious Mediterranean recipes at lunch time. For those occasions when you decide to stay in a secluded bay for the evening, she will cook an unforgettable dinner for you. Maria will take care of everything during your cruise and make sure that this sailing trip will be one of the best holidays of your life. Dimitra graduated from Athens University with a degree in English Literature but her love for the sea and the easy-going pace of life at the Greek Islands led her to a career in yachting. Before joining us, she taught English language but she also spent a season as a pool supervisor at a water park and another season at the island of Santorini where she worked in a hotel. She was born in Greece in 1994 and her home town is Patra, on the north-western coast of the Peloponnese. Except for English which of course she speaks very fluently and Greek which is her native language, she also speaks Polish and Spanish. Her love for travelling, meeting people and exploring different cultures took her to Poland and Serbia where she spent a few months working in hotels, but to other countries as well which she visited as a traveler. Dimitra is an excellent cook and in her galley she will prepare for you Alicia’s delicious Mediterranean dishes that have given our cruises their gourmet character! In her free time she likes to participate in theater plays, photography and of course travel. With her easy-going personality she will make you feel at home from the moment you step on the yacht.